As this month letter ‘Bb’ and number 3 was introduced, the rhyme of the month was ‘Baa Baa Black Sheep’. 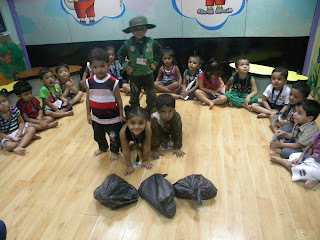 Children came dressed as Mary, a lamb, the master and a little boy and enacted the rhyme on Thursday 12th July’2012. Teacher explained about the characters and what they do for us. The rhyme was sung by all along with the teacher. 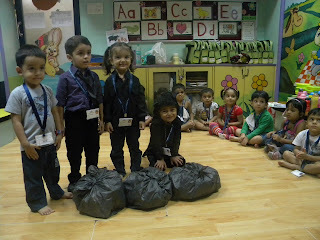 The children enacted the rhyme and through rhyme letter ‘Bb’ and number 3 was also reinforced. Enactment there by helps children in “learning by doing”.